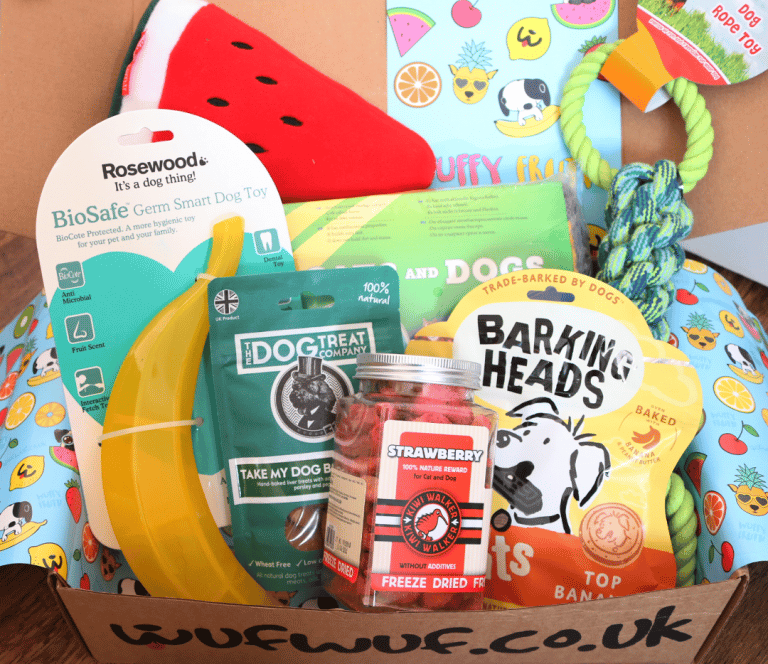 WufWuf is a fantastic monthly subscription box for your pooch and a really fun way to spoil your furry best friend! 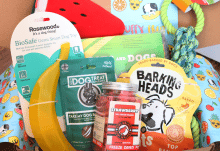 Each box is packed full of a selection of carefully chosen Treats, Toys, Chews, Accessories and/or Grooming items, and the contents will be worth at least £40. 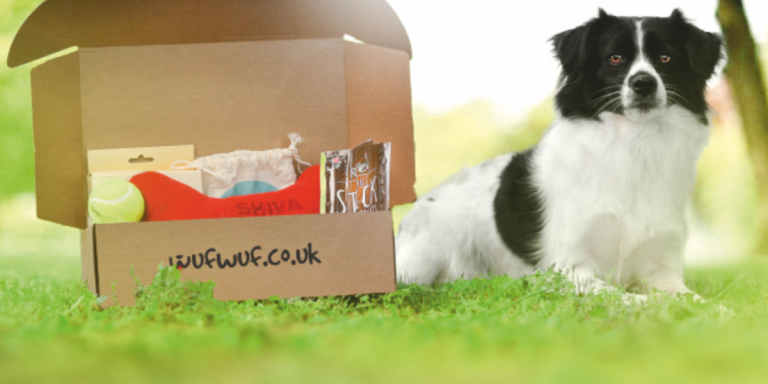 Postage is free and you can cancel at any time, so why not give WufWuf a try today? This month’s box is themed Wuffy Frutti and has some very cute fruity items in it, so let’s see what’s inside! The first product that I took out of the box was rather interesting and I’ve never seen anything like this in any of my local pet stores before. 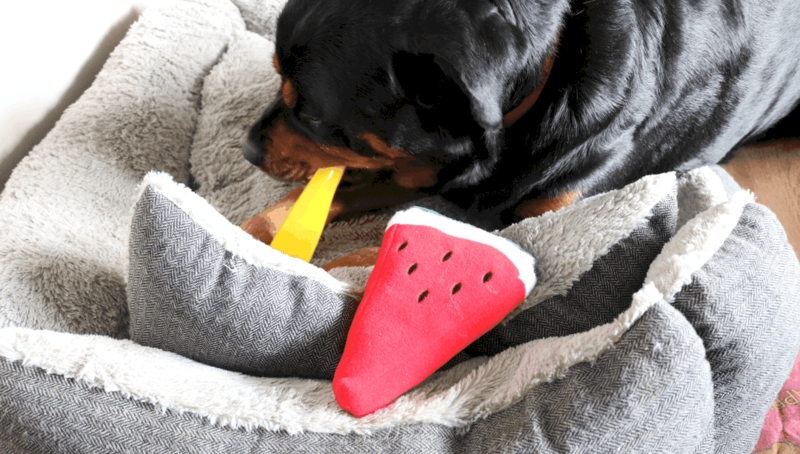 It’s a ‘germ smart’ dog toy which is coated in an innovative antimicrobial technology called BioCote. This coating prevents the growth and survival of microbes including bacteria, mould and funghi – how clever is that?! It’s also scented like a banana and has a thick, smooth, plastic style texture. 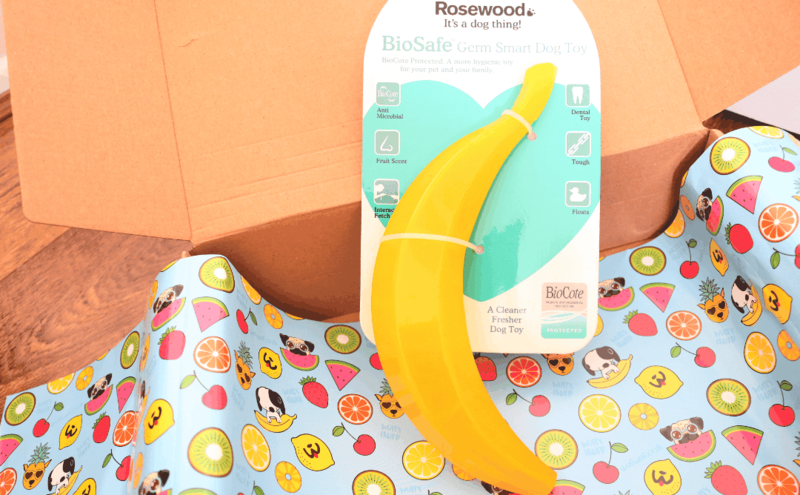 Toby has been enjoying playing with this and I suspect it’s because he loves the banana scent which must be very appealing to dogs! Next up, there’s a large Antibacterial Drying Towel which is made from a lovely soft and absorbent microfibre material that doesn’t hold dirt and stains, so that it’s super easy to clean and dries very quickly too. 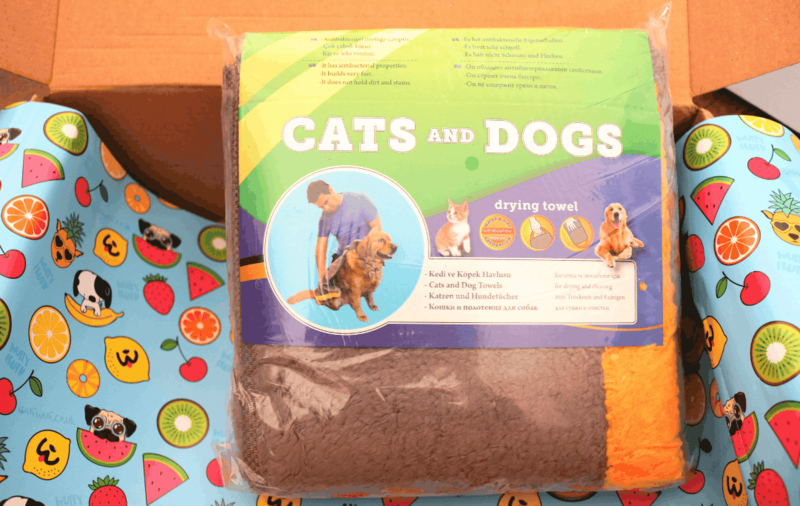 As it rains so much in the UK, these towels always come in very handy and they’d be ideal to keep in the car to wipe your dog’s feet after walks in the countryside. 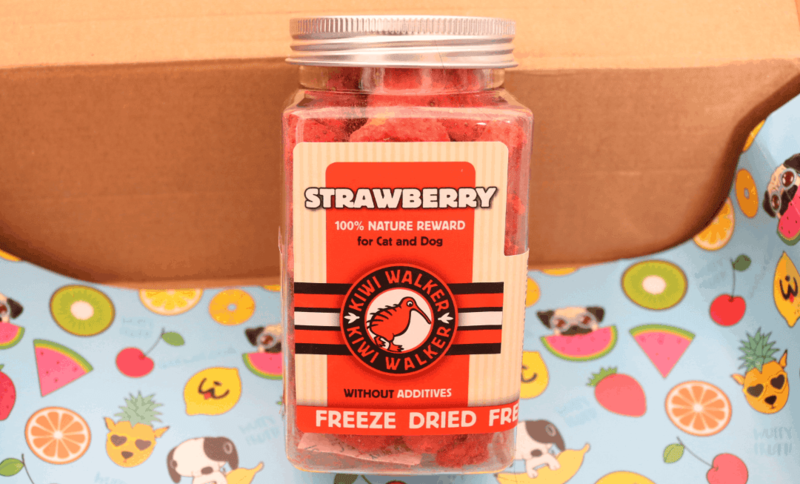 Back to this month’s fruity theme, I found a tub of Freeze Dried Strawberry treats from Kiwi Walker. 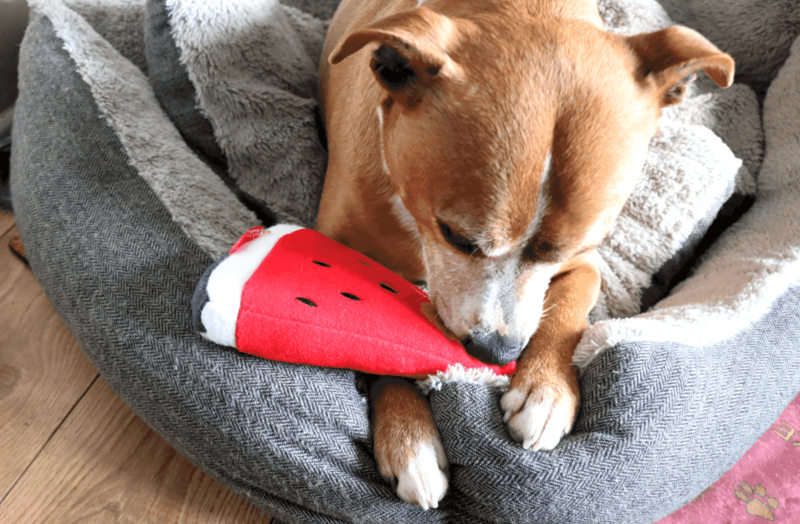 Made from just 100% strawberries and with no additives or any other ingredients, these are a healthy, vitamin-rich, low-fat treat for your dog. I wasn’t sure if mine were going to like these as I’ve only given them fresh Banana as a fruity treat before, but they both loved them! 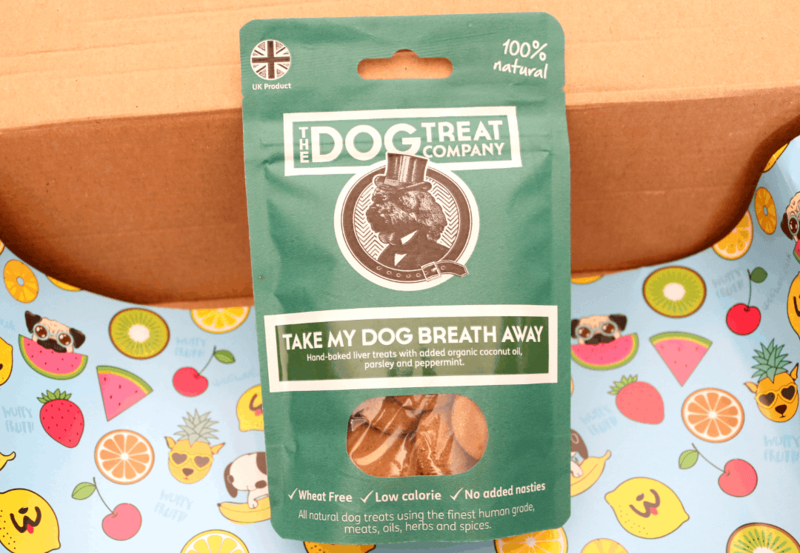 If you have a pet dog, you’ll be all too familiar with their ‘doggie breath’ so I was happy to see this next bag of treats from the British The Dog Treat Company included in this month’s box. These hand-baked, all-natural treats contain Liver, Organic Coconut Oil, Parsley and Peppermint for a tasty way to freshen up their breath. They’re also wheat free, low in calories and have no ‘nasties’. 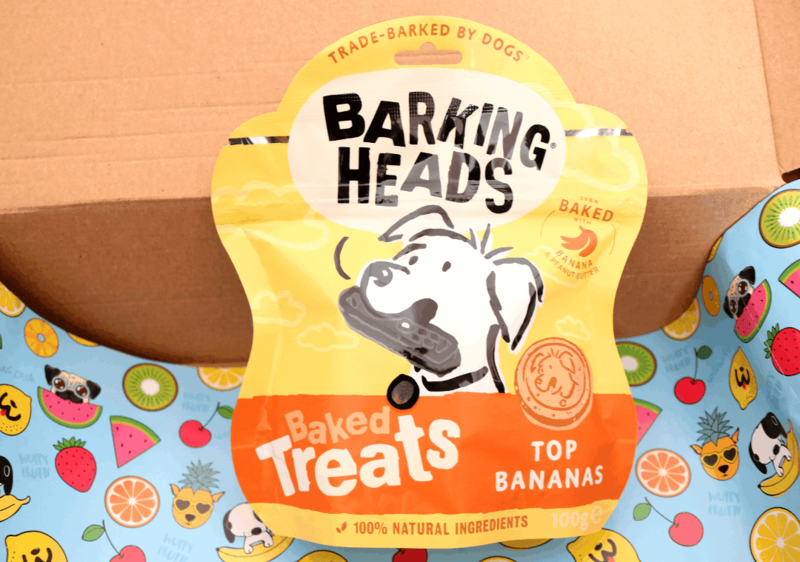 Another 100% natural treat comes from the British brand Barking Heads, and these baked goodies are handmade with Banana, Peanut Butter, Sweet Potato and Peas for a delicious healthy treat that can be stuffed into toys or used during training. They are grain-free and baked in small batches here in the UK. Toby especially loved these! 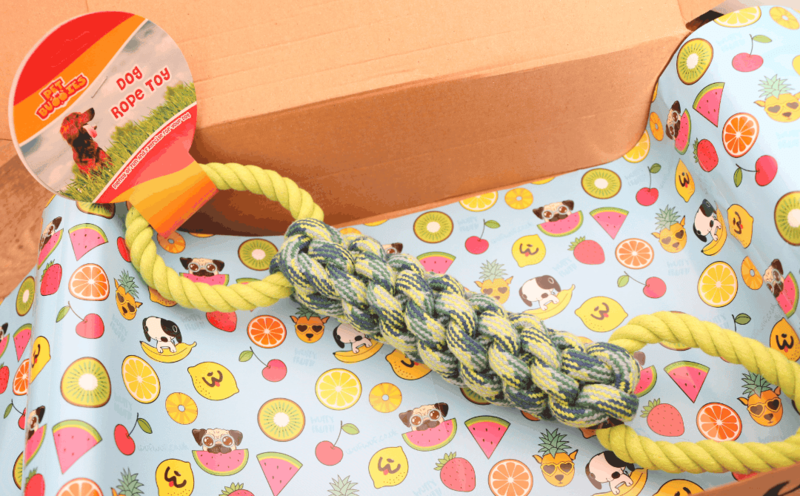 This thick and chunky Dog Rope Toy from Pet Buddies is a great way to encourage your dogs to chew and helps to promote healthy teeth and gums. It’s a large size and has two handles that you can use to play ‘Tug Of War’ – one of Chloe’s favourite games! 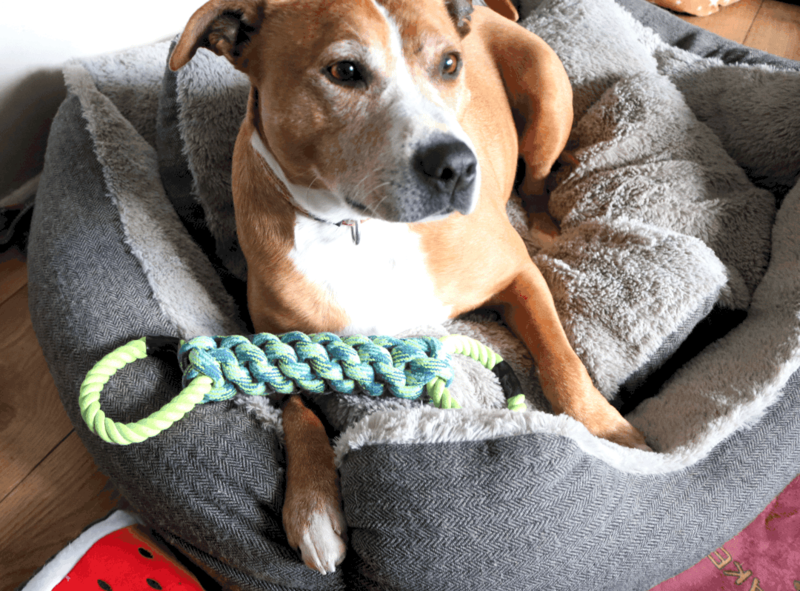 When she’s done playing with it, she likes to put it into her bed as a reward for ‘winning’ it! 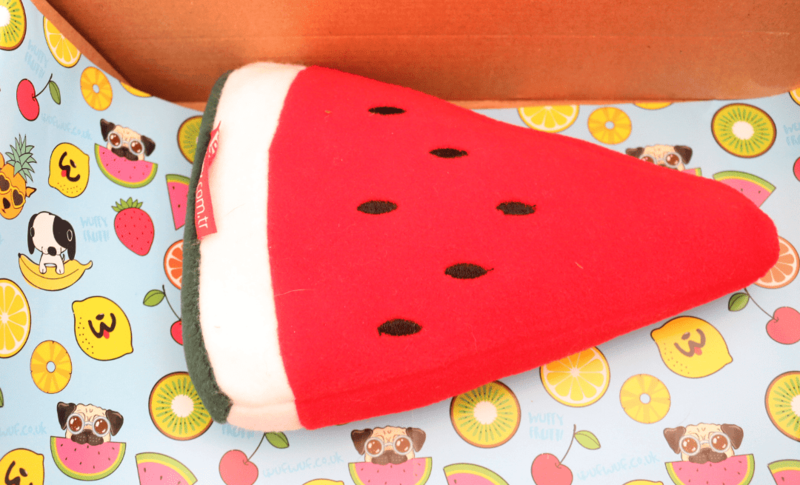 The last product in this month’s fruity themed box is a Handmade Watermelon soft toy that features a squeaker inside. 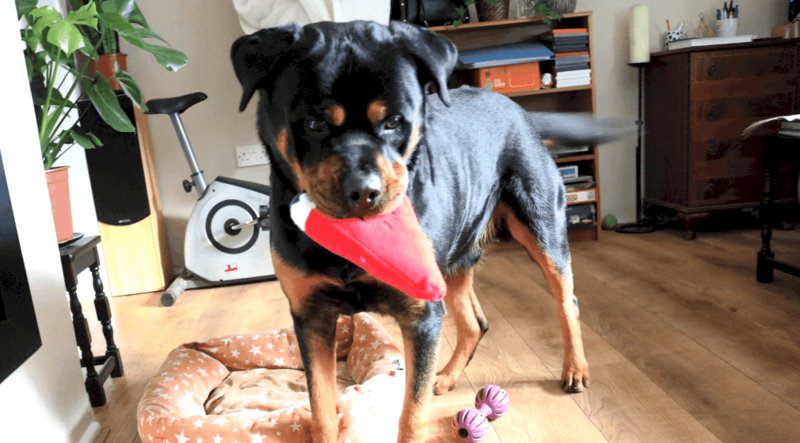 This is a really fun toy as it looks quite comical seeing the dogs carry it around the house. Both Toby and Chloe love squeaker toys! 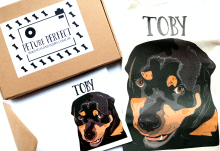 My dogs love their WufWuf box every month and I'm sure yours will too so give them a go!